I don't need an answer to this so please, please don't worry if you don't have time, but I was just reading about "night eating syndrome", which seems now to have been declared a disorder of its own. And I wondered if you had any reflections on it. I know that night eating is associated with lots of different eating disorders, but - with some of these disorders, surely one has to prioritise which problems are worth fighting and how? And given that night eating can be important in some circumstances, one needs to be careful about when one starts worrying about it as a disorder? I don't *need* an answer to this, it was just interest really. Dont worry about asking me questions :)If i have the time i'll do my best to answer. I have heard about night eating syndrome before and from what i understand it can actually be genetic, but also a person can start doing it due to stress or depression. But also, if a person hasnt eaten enough during the day it can be incredibly hard to sleep and you can eat lots in the evening as your body so badly wants the energy and food. So it isnt strange to eat lots in the evening if you havent eaten alot dring the day, its what can be expected so to say. And if you wake in the middle of the night hungry and you go up to eat, that doesnt necessarily mean that it is disordered but the fact that you havent eaten enough during the day. Though then the night eating is due to the fact that you have been restricting during the day, so then its sort of natural that you want to eat lots during the evenings. Some people do this as they want to restrict or "save calories" but then in the evening they are just so hungry so they eat lots, but then the eating can almost be a binge as they eat so much due to hunger, which then leads to guilt or anxiety and can then lead to restricting the next day to compensate and so the cycle continues. With night eating syndrome, the signs and behaviours should have persisted for two months or more... meaning that if now and again you eat lots in the evening or you get up to eat in the nigh due to hunger, it doesnt mean that you suddenly have night eating syndrome. For example there have been days where my foood intake has been very low or example when i worked at a festival and my day consisted of 9 hours of constantly moving and lifting and running around and during that time i didnt have time to eat and the lunch definitely wasnt enough. So when i got home i most probably ate around 1000-1500 between 7pm-11pm. And it was neither a binge or a disorder, but it was because i knew that i had used so much energy during the day and not gotten enough energy into me so i had to eat lots to make up for it, and also the fact that i had the same schedule the next day so i needed that energy. So at times like that when you havent eaten enough during the day - and not necessarily by choice or restriction, then eating lots in the evening can be beneficial. But it shouldnt be an everyday thing either, because naturally the body needs more food during the day and morning when you are active and doing things/thinking etc compared to when you are sleeping. It is important to remember as well that night eating syndrome leads the people suffering to feel like they have no control, almost like the state when a person is binging... they arent really present mentally. Or they might be aware what they are doing, but they cant stop it. So they eat even if they arent hungry during the night and often due to emotions. 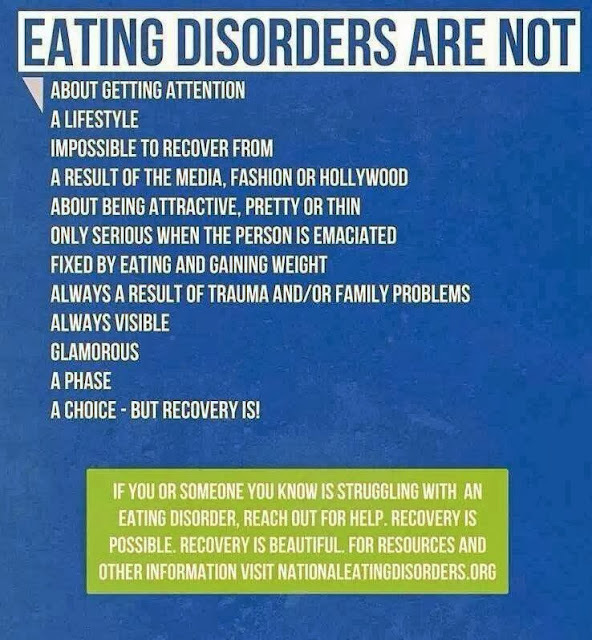 I dont know what i think about the fact that it is now classified as an eating disorder (? ), or whether it should just be disordered eating. But considering the fact that the person suffering sort of loses control and it is not just that they are super hungry or "cant seem to go on a diet", but that the behaviours are triggered due to certain emotions or feelings and the person is sort of "Out of it". So it is a bit more serious compared to someone who makes sure that the different foods on the plate dont touch each other, which is more of disordered eating rather than an eating disorder. But of course the thing about eating disorder and disordered eating is that bits of everything can be present in the other disorder, such as some who struggle with anorexia nervosa can still struggle with binge eating and purging, or some people with bulimia restrict lots to compensate for the binges. But their are different diagnoses with different degrees of seriousness, for example i was diagnosed with anorexia with purging tendencies and i think their are different degrees of severity with the diagnosis, though i am not fully sure about that. But i saw my number diagnoses sometime while at Mando and then checked up the criteria as they are a little different for the small variations within the eating disorder (please correct me if i am wrong!). Before this post gets too long i will finish here. The thing about night eating syndrome is that it is a continuous thing for a while, just like with all eating disorders. Because if it is done once in a while it might be more of a sign of disordered eating rather than an eating disorder such as if someone restricts now and again due to guilt it doesnt mean they suddenly have anorexia, but that they have some type of disordered eating/unhealthy thoughts as a normal person shouldnt feel the need to massively restrict (force themself to starve) to compensate. So its about how often, the mindset and also the control factor. But also, most people will be somewhat aware of whether their problems are that of an eating disorder or just weird thoughts/behaviours now and again. If certain behaviours are done often for a long period of time and you know they arent normal or you feel ashamed about them or know they are "wrong", then you'll realise that the behaviour is that of disordered eating or an eating disorder and needs help. Ive never heard of this before but it was interesting to read about it. Thankyou for such an informative post - you learn something every day! I've been suffering from this in almost three years time now.. It sure destroys my life and I have no idea what to do to stop it :/ The anxiety the morning after is horrible and my life is messed up because of it..